High-dimensional analysis of CD4 T cells elicited during primary γHV68 infection. Mass cytometric analysis of cells recovered from the lungs of γHV68-infected B6 mice at 9 dpi and subjected to ICCS analysis using a 35-Ab panel (Table I). Data were gated on viable CD4 T cells, defined as 191Ir+ 193Ir+ 195Pt− 152CD3ε+ 172CD4+ 174MHC II− events, where numbers indicate isotopic mass for each measured parameter. (A) Analysis of IFN-γ and TNF-α production from CD4 T cells subjected to pharmacologic stimulation with PMA and ionomycin. The mean ± SEM for each population is identified in each quadrant. Events in each quadrant were further analyzed using the PhenoGraph algorithm and plotted using the tSNE dimensionality reduction algorithm. Events were imported into PhenoGraph and clustered on 8320 events total and 30 markers (clustering parameters identified in Table I). In total, 16 clusters were identified, with clusters colored by cluster identifier (ID) and displayed on tSNE plots. (B) Distribution of PhenoGraph-defined clusters within CD4 T cells, stratified by expression of IFN-γ and TNF-α. 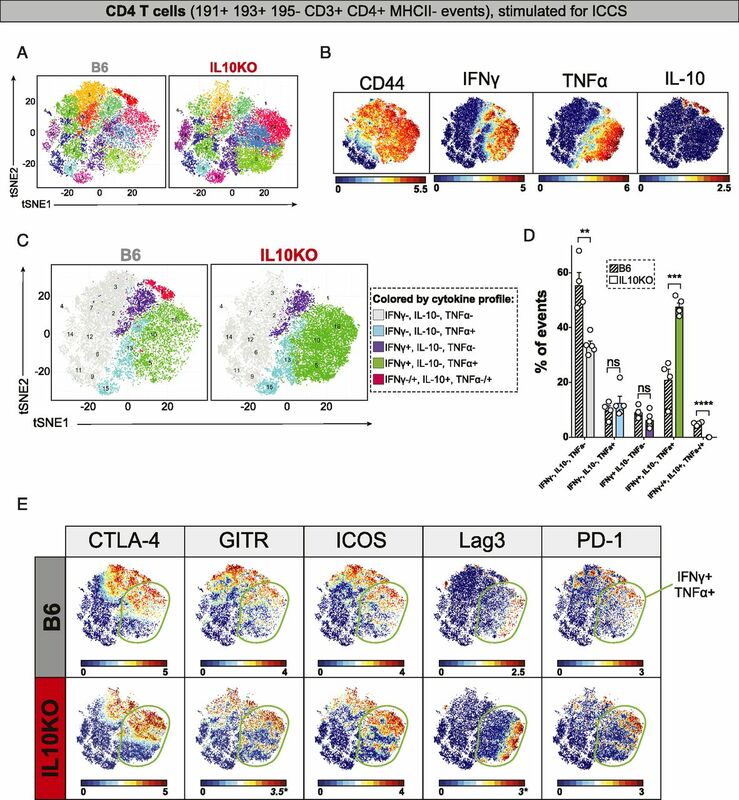 Each pie chart is subdivided into clusters that are equally represented in IFN-γ− and IFN-γ+ CD4 T cells (shades of gray), clusters that are enriched in IFN-γ− CD4 T cells (pastel colors), clusters that are enriched only in cytokine-producing CD4 T cells (black), and clusters that are enriched in IFN-γ+ CD4 T cells (saturated colors), as defined in the key. 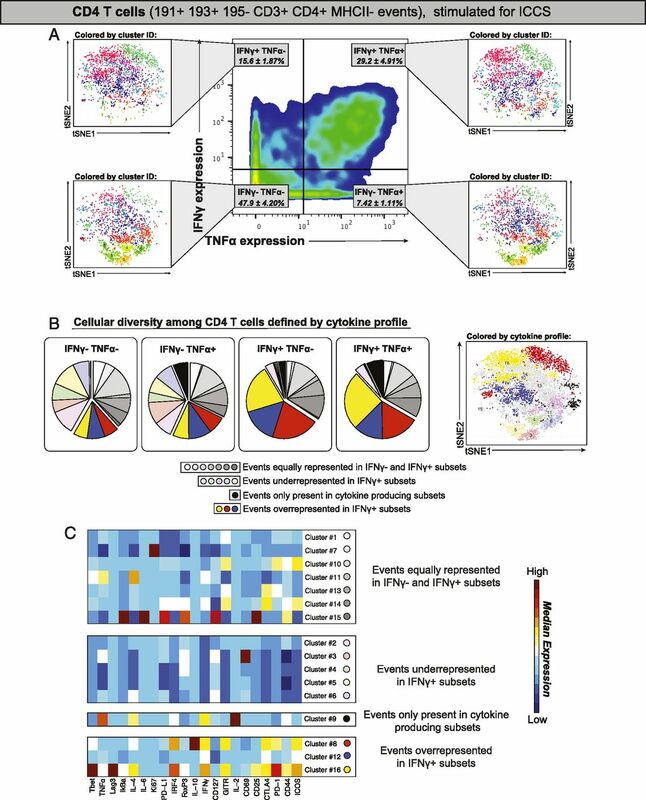 Right panel shows events depicted using tSNE, in which each cluster is colored according to the cytokine profile subsets (see key). (C) Phenotypic marker expression (in columns) of PhenoGraph-defined clusters (in rows), stratified by their enrichment as a function of cytokine profile. Clusters are stratified as in (B). Data are from virally infected B6 lungs (n = 4 mice) harvested 9 dpi, with cells stimulated with PMA and ionomycin for 5 h prior to Ab staining. High-dimensional analysis of IL10gfp expression during acute γHV68 infection in the lung. Mass cytometric analysis of cells recovered from the lungs of γHV68-infected IL10gfp mice at 6 dpi. Files were normalized, with events gated on (A) total viable single cells (defined as 191Ir+ 193Ir+ 195Pt−) or (B–D) viable CD4+ T cells (defined as 191Ir+ 193Ir+ 195Pt− 152CD3ε+ 172CD4+ 174MHC II−) prior to analysis, where numbers indicate isotopic mass for each measured parameter. (A) PhenoGraph analysis of cellular phenotypes in mock- and virally infected lung (28,924 events total), clustered based on 29 markers (Table II), identified 34 unique clusters, with cluster phenotype defined according to the indicated lineage markers. The CD45+ cluster was defined by its expression of CD45+ and absence of other lineage-defining markers. The right panel of (A) shows all viable singlet events from mock- and virally infected lungs, with events colored according to IL10gfp expression. The green boundary line defines CD4+ T cells. 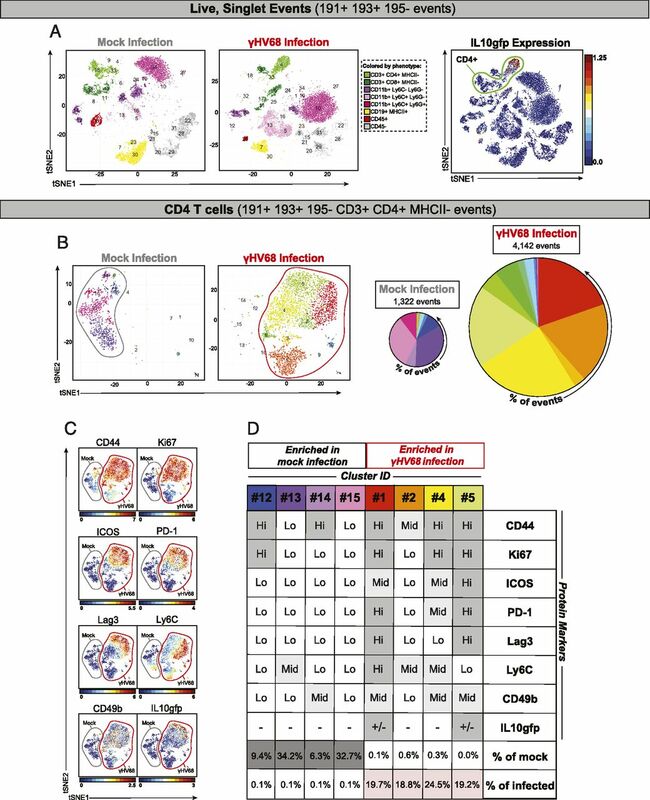 (B) Mass cytometric analysis and PhenoGraph-based cell clustering of CD4+ T cells (5464 events total, clustered based on 26 markers, excluding CD3, CD4, and MHC II; Table II). In total, 16 unique clusters were identified and visualized on a tSNE plot (left). The number and frequency of CD4 T cell clusters are shown in the right panel, with pie charts sized proportionally to the relative number of CD4 T cells in mock- or virus-infected lung. (C) Phenotypic analysis of CD4 T cells, with events predominantly in mock infection denoted with a gray boundary and events predominantly in virus infection denoted with a red boundary. 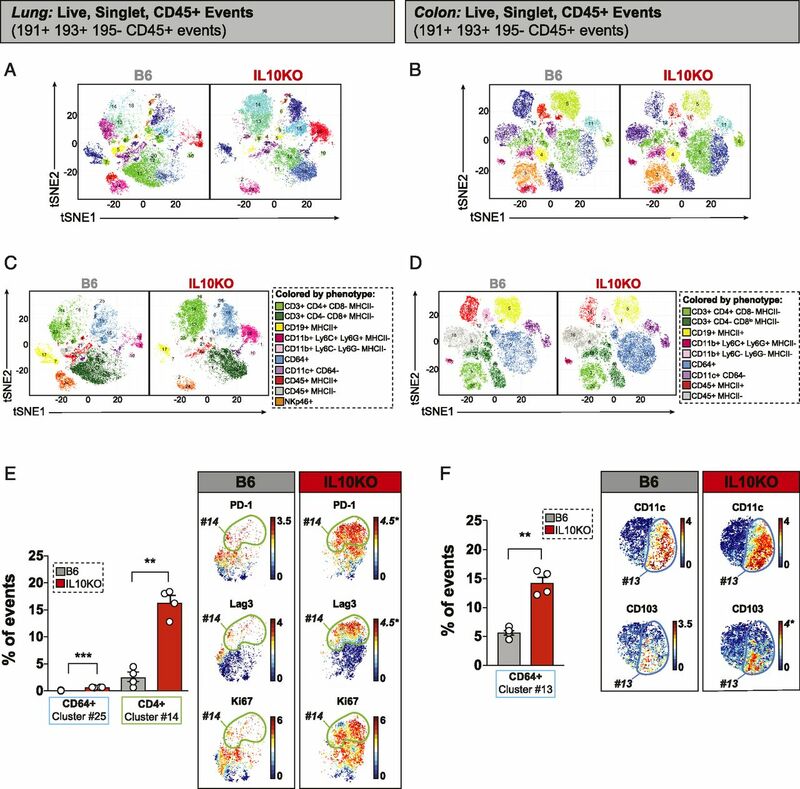 Data depict CD4 T cells plotted according to tSNE1 and tSNE2 as in (B), with individual plots depicting relative protein expression for the identified marker portrayed by color intensity, with range of expression indicated on the bottom of each panel. Panels are ordered based on the frequency of positive events. (D) Summary of CD4 T cell clusters (in columns) that differ between mock- and γHV68-infected lungs, with protein expression denoted in rows (gray shading scaled relative to expression level). Data are from the lungs of a mock- or γHV68-infected mouse harvested at 6 dpi, with (D) quantifying the frequency of events in each cluster as a percentage of CD4+ T cells. γHV68 infection elicits a dominant IL10gfp-expressing CD4 T cell population that differs relative to IL10gfp-expressing CD4 T cells in anti-CD3 Ab–injected mice. Mass cytometric analysis of cells recovered from IL10gfp mice comparing CD4 T cell phenotypes between the spleens of anti-CD3 Ab–injected mice and the lungs of γHV68-infected mice harvested at 6 dpi. Files were normalized and gated on viable CD4+ T cells (defined as 191Ir+ 193Ir+ 195Pt− 152CD3ε+ 172CD4+ 209MHC II−) prior to analysis, where numbers indicate isotopic mass for each measured parameter. 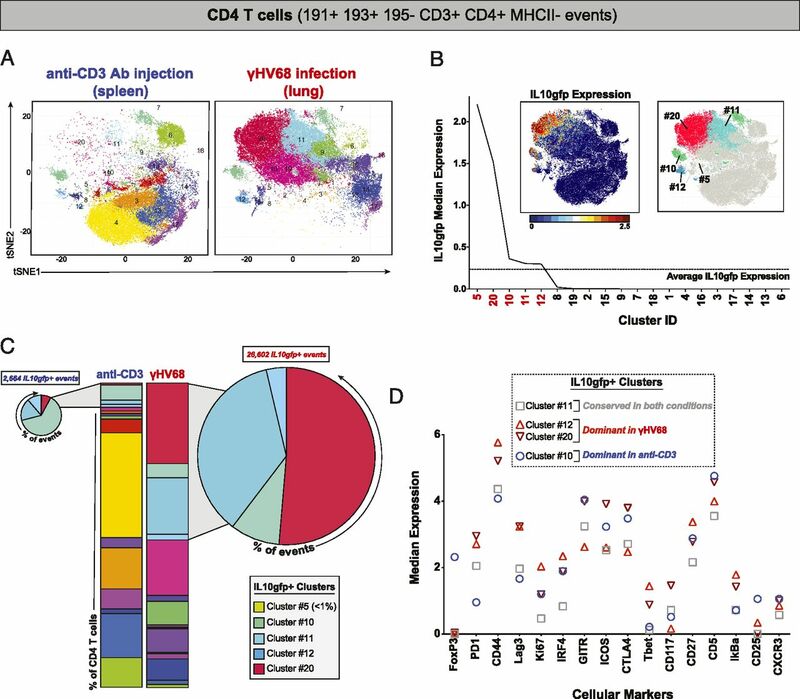 (A) PhenoGraph analysis of CD4 T cells comparing anti-CD3 Ab–injected versus γHV68-infected samples (75,483 events total, clustered on 33 markers, excluding CD3, CD4, and MHC II; Table III) identified 20 unique clusters, each denoted with a distinct color. (B) PhenoGraph-defined CD4 T cell clusters were ranked based on IL10gfp expression, with five clusters having higher than average IL10gfp expression identified in red text. Figure insets depict all events from (A), colored according to (left panel) IL10gfp expression or (right panel) cluster identifier (ID) for five IL10gfp+ clusters. (C) The frequencies of CD4 T cell clusters are shown for both conditions, with focused analysis on the distribution of IL10gfp+ clusters identified by shaded gray extensions and pie charts on either side. Pie charts denote the frequencies of IL10gfp+ events in each condition, with pie charts sized according to the relative number of IL10gfp+ events present in each condition. (D) Comparison of median protein expression within IL10gfp+ CD4 T cell clusters in anti-CD3 Ab–injected spleens and/or γHV68-infected lungs. Cellular markers are ordered by range in median expression between clusters from greatest to least in value. Data are from IL10gfp mice using either spleens from mice that were injected with an anti-CD3 Ab (injected with Ab at 0 and 46 h with harvest at 50 h, n = 4 mice) or lungs from γHV68-infected mice (n = 5) harvested at 6 dpi. High-dimensional analysis of IL-10–dependent regulation of the antiviral response in the lung and the colon. Mass cytometric analysis of cells recovered from lungs (A, C, and E) or colons (B, D, and F) of γHV68-infected B6 or IL-10KO mice harvested at 9 dpi. Files were normalized and gated on viable, single CD45+ cells (defined as 191Ir+ 193Ir+ 195Pt− 89CD45+) prior to analysis, where numbers indicate isotopic mass for each measured parameter. (A and B) PhenoGraph analysis of CD45+ cells from (A) lungs or (B) colons of γHV68-infected B6 or IL-10KO mice. Clustering was done on 4344 events per file (34,752 total), with clustering in the lung based on 34 markers (29 clusters identified; Table IV) and clustering in the colon based on 36 markers (20 clusters identified; Table V); lungs and colons were harvested from separate cohorts. PhenoGraph-defined clusters are colored according to cluster identifier. (C and D) Definition of cellular phenotypes across PhenoGraph-defined clusters according to the indicated lineage markers, with distinct cell types given unique colors. CD45+ MHC II+ and CD45+ MHC II− clusters were defined by exclusion from other phenotypes. (E and F) Identification of clusters with statistically significant differences in frequency between B6 and IL-10KO infected (E) lungs and (F) colons, showing cluster frequencies (left panel) and expression for the identified parameters within the identified cluster (right panel). In the right panel of (E), plotted events are CD4+ T cells identified in (C). In the right panel of (F), plotted events are the dominant CD64+ cell clusters identified in (D). Parameters with a different maximum scale value between B6 and IL-10KO are identified by italicized text and an asterisk. Data are from γHV68-infected B6 and IL-10KO lungs (n = 4 mice per genotype) and colons (n = 4 mice per genotype) harvested 9 dpi. Data depict mean ± SEM, with individual symbols indicating values from independent samples. All samples were analyzed for statistical significance using unpaired t tests, corrected for multiple comparisons using the Holm-Sidak method. **p < 0.01, ***p < 0.001. High-dimensional analysis of effector CD4 T cell function following γHV68 infection in B6 and IL-10KO mice. Mass cytometric analysis of cells recovered from lungs of γHV68-infected B6 or IL-10KO mice harvested at 9 dpi, with cells subjected to pharmacologic stimulation for ICCS analysis using a 35-Ab panel (Table I). Files were normalized, with data gated on viable CD4 T cells, defined as 191Ir+ 193Ir+ 195Pt− 152CD3ε+ 172CD4+ 174MHC II− events, where numbers indicate isotopic mass for each measured parameter. (A) CD4 T cells were imported into PhenoGraph and clustered on 33,022 total events (3669 events from each file) and 32 markers (excluding CD3, CD4, and MHC II; Table I), identifying 16 unique clusters portrayed on a tSNE plot. (B) All events from (A) are colored by CD44, IFN-γ, TNF-α, and IL-10 expression. (C) Events from (A) are colored based on their cytokine profile, stratified based on IFN-γ, TNF-α, and IL-10 expression. (D) Frequency of CD4 T cells in virally infected B6 and IL-10KO mice. (E) Comparison of CTLA-4, GITR, ICOS, Lag3, and PD-1 expression across CD4 T cells from B6 (top row) or IL-10KO (bottom row) mice, in which IFN-γ+ TNF-α+ CD4 T cells were identified by a green boundary line. Parameters with a different maximum scale value between B6 and IL-10KO are identified by italicized text and an asterisk. Data from virally infected lungs of B6 (n = 4) and IL-10KO (n = 5) mice harvested 9 dpi, with cells stimulated with PMA and ionomycin for 5 h prior to ICCS. Data for B6 mice were also included in Fig. 1, subjected to different clustering parameters (as outlined in Table I). Data show mean ± SEM with individual symbols denoting individual mice, with statistical analysis done by unpaired t test, corrected for multiple comparisons using the Holm-Sidak method. **p < 0.01, ***p < 0.001, ****p ≤ 0.0001. ns, not significant. ↵a Clustering parameters used for Figs. 1 and 5 differed as indicated. ↵a Clustering parameters used for Fig. 2B–D excluded CD3ε, CD4, and MHC II.